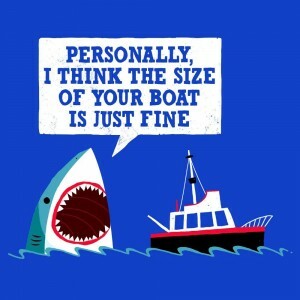 Jaws doesn’t particularly care about the size of your boat. As long as it fits inside his mouth. But he’s not gonna complain either way. Even if it doesn’t fit whole into his mouth, he’s got a lifetime to chew it up into tiny bits and digest whatever living material happens to be in it. What I’m trying to say is that Jaws isn’t going to push you into getting a new boat. The one you have is just fine. It’ll fit through his digestive system the same as any yacht or cruise ship.